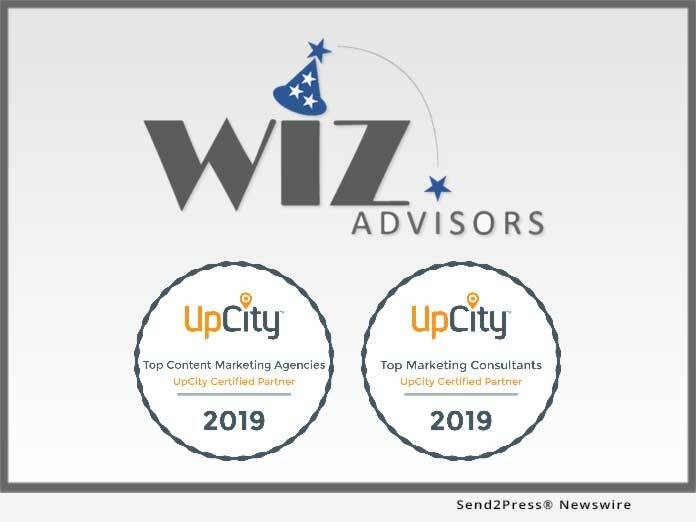 ALEXANDRIA, Va., Apr 10, 2019 (SEND2PRESS NEWSWIRE) -- WIZ Advisors LLC just announced today that it has been included in UpCity's local digital marketing agency marketplace as one of the top marketing consultants in Washington D.C. in 2019. It has also been included as a top local content marketing agency. You can view WIZ Advisors' profile on the UpCity site here: https://upcity.com/local-marketing-agencies/profiles/wiz-advisors, link to the lists, and see reviews. "It is a huge honor to be designated a Top Local Marketer after just launching WIZ Advisors in 2017," said Stacey Wisniewski, the company's Founder and Chief Marketing Strategist. "What I believe distinguishes WIZ Advisors amongst hundreds of other marketing agencies comes down to three things: experience, flexibility and customer service." "The drive and experience that WIZ Advisors brings to the table is incredible," says Jacques Cartier, CFO for a privately-owned leading manufacturing company. "The value well exceeds the pricing, which says a lot coming from a CFO." Another client, Traci DeForge, CEO of Produce Your Podcast, points to WIZ's focus on relationships: "Stacey is a shining star in a sea of digital marketers. Her focus on customer service makes a huge difference in working with WIZ Advisors - she always goes above and beyond to deliver the highest quality results." WIZ Advisors LLC is a woman-owned and operated marketing strategy agency, founded in February 2017. It provides a full suite of marketing solutions across the customer lifecycle to help small to mid-size B2B businesses build their brand awareness, increase quality leads, drive customer engagement and loyalty, and accelerate revenue. Unlike marketing agencies that use cookie cutter methods and templates to solve their clients' pain points, WIZ Advisors employs a customer-centric, research-driven approach, focusing on each client's unique strengths and challenges, and delivering solutions that are tailored to their specific goals. Learn more at: https://wizadvisors.com/. If you'd like to contact WIZ Advisors, you can call or email Stacey Wisniewski directly at: (615) 934-1817 or stacey@wizadvisors.com. The post WIZ Advisors was just awarded ‘Top Marketing Consultant’ and ‘Top Content Marketing Agency’ in Washington DC in 2019 appeared first on Florida Newswire.